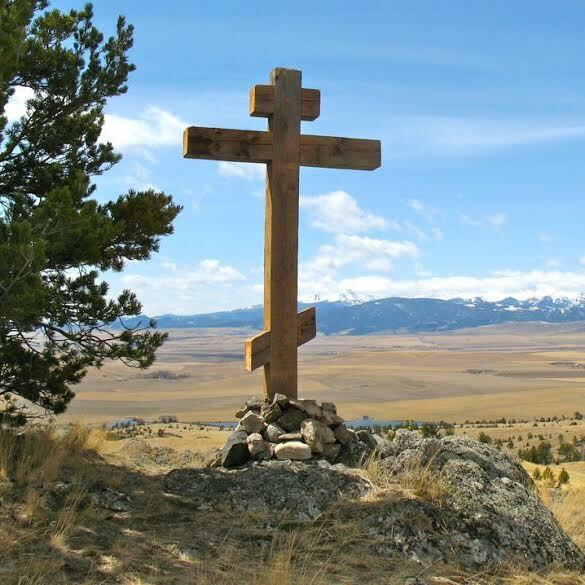 At the end of September 2015, Father Innocent and Brother Ioann of the Orthodox Church in America’s Saint John of Shanghai and San Francisco Monastery, Manton, CA and Brother Donald of the Serbian Western America Diocese’s Saint Herman Monastery, Platina, CA packed their bags and hopped into the Chevy pickup to head to Harrison, MT to begin work on the foundation of the new OCA monastery dedicated to Saint Peter the Apostle. The monastery is being built on land owned by David and Betsy Hicks. In 2011, a large wooden cross had been planted on the property when His Eminence, Archbishop Benjamin of San Francisco and the West blessed the establishment of the monastery. An architect from Saint Anthony parish has drawn up plans for the monastery, which will be built in several stages. “After completing basic utility buildings on the ground level and a temporary chapel, an upper level with office space, monks’ quarters, and workshops will be built,” Brother Ioann added. “In time, work will begin on the main church and dining hall, along with the courtyard, fountain, and landscaping.